Dedicated to the courage and tireless perseverance of the workingmen, unlike other titles that at the time were highly commended by Communist critics, The Coal Mine doesn’t contain any voice-over commentary. Even though its original editing technique somewhat resembles Soviet films by Sergei Eisenstein (1898-1948) and Lev Kuleshov (1899-1970), neither Brzozowska’s stylised imagery nor her tragic portrayal of destructive industrialisation could appeal to the Communist Party leaders at the end of the 1940s when they bet on socialist realism. Dedicated to the courage and tireless perseverance of the workingmen, unlike other titles that at the time were highly commended by Communist critics, The Coal Mine doesn’t contain any voice-over commentary. Even though its original editing technique somewhat resembles Soviet films by Sergei Eisenstein (1898-1948) and Lev Kuleshov (1899-1970), neither Brzozowska’s stylised imagery nor her tragic portrayal of destructive industrialisation could appeal to the Communist Party leaders at the end of the 1940s when they bet on socialist realism. 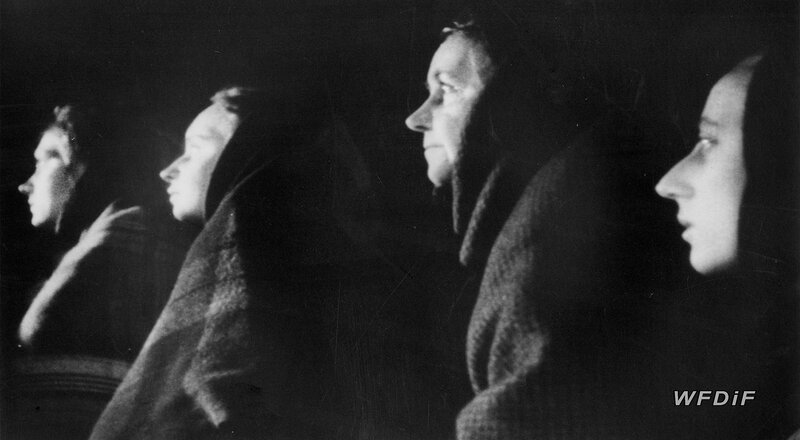 In the film, silent shots of human figures seemingly dissolving into the black, bottomless chasm of the mine rhythmically play to the sound of music composed by Kazimierz Serocki (1922-1981). The dynamically cut, dark and underlit images show miners getting ready for work and then performing their daily underground tasks. The film culminates with the stillness of their wives desperately waiting for the husbands to come out after an underground accident. The mine turns into a deadly abyss. Nature wins over human effort. Many shots with dimming lights in horror-like corridors are intercut with observational images of women standing over ground near the mineshaft. These widow-like figures with black headscarves are presented in a series of tracking shots mixed with close-ups of hands and faces that appear frozen in expressions full of fear. This wait doesn’t bear any fruit. We only observe heaps of coal transported up the corridors using waggons and conveyor belts. Not a single man comes out. The final underground shots show ghost-like silhouettes of men, presumably either trapped or already dead. It is impossible to establish the difference between the reality and the projection of the women’s stress and fear. Earlier the viewer witnesses the tragedy of an underground accident, whose scale is amplified by many extreme close-ups of frightened miners’ faces. Several shots later, the women still wait in vain. When in the final frame of the film clouds sail by the mineshaft, life just goes on. The heavy industry keeps working, and the significance of a few lost lives of the workers doesn’t change the grand scheme of its operations. With its expressionistic shots and the overall pessimism, at the turn of the 1940s and the 1950s, The Coal Mine didn’t fit into the socialist realist style. Heavily criticised, it was shelved for a few years after the Congress in Wisła.